Strikeforce Heavyweight champion, Alistair Overeem, enters this Saturday’s Heavyweight Grand Prix with a nine-fight win streak and a good reason. If all goes well, he will soon add the Heavyweight Grand Prix championship title to his belt collection. And when that happens, Alistair Overeem sees no reason to compete for a UFC title next. “It’s all about achieving a goal, and then you look toward the next goal. This is my next goal. The other [titles] are very important to me. Nobody can ever take them away. But this is the next thing. After this tournament, there will be something else. Arguing with the heavyweight champ’s point of view can be difficult. While UFC’s heavyweight division is loaded with best fighters, Strikeforce has Josh Barnett, Sergei Kharitonov, Brett Rogers and Antonio Silva. In addition to this, the promotion also have Alistair Overeem and Fabricio Werdum. So any fighter who gets pass through them has bragging rights to ask for more than the grand prix title. 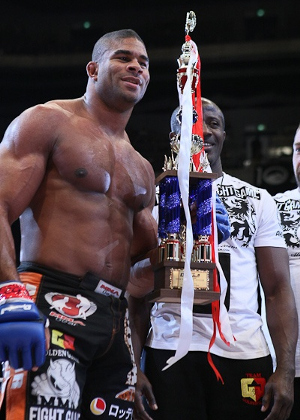 However, a win for Alistair Overeem will give him a semifinal bout against Antonio Silva sometime this fall. The Strikeforce Heavyweight Grand Prix finals is slated by early 2012. In the meantime, UFC Heavyweight champion – Cain Velasquez – is set to meet Junior Dos Santos. But whether the winner will face whoever remains standing at the Strikeforce Heavyweight Grand Prix or not, that remains to be seen. Executives of both promotions are not at leisure to declare the said match a possibility. But until something is decided, Alistair Overeem will remain focused on the task at hand.